I really enjoy baking quick breads and muffins to freeze in individual servings for a quick breakfast or snack option. Last week I found myself with a past its prime banana and a little bit of leftover canned pumpkin puree so I thought I would combine the two to make banana pumpkin bread. Since I typically end up eating this kind of thing for breakfast, I wanted to put a healthier spin on the bread. 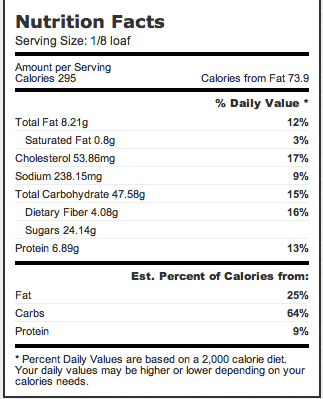 Since bananas provide so much natural sweetness I was able to reduce the amount of sugar that I used. I also subbed half of the flour for whole wheat and used plain Greek yogurt in place of some of the oil. Easy swaps that make a difference in the overall nutrition stats. I did still top it with a pumpkin glaze but it was worth it! The bread was very easy to put together and didn’t even require the use of a mixer. I think I had it in the oven in under 15 minutes. Once it cooled I topped it with the glaze and then let the glaze set. 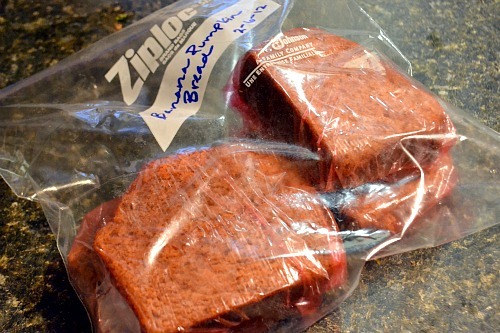 I then sliced the bread into individual slices that I wrapped in saran wrap and placed in a gallon bag. I placed the bag in the freezer so I can grab a slice whenever I need a quick breakfast. All it needs is a quick 30 seconds in the microwave. Sometimes I like to pop the slice into the toaster for a minute or so too for texture. It’s extra delicious topped with butter, jam or nut butter! Preheat oven to 350 degrees. Spray a 9 x 5 loaf pan with cooking spray and set aside. In medium bowl, whisk together flour, baking powder, baking soda, pumpkin pie spice and salt. In large bowl, mix together pumpkin, banana, yogurt, oil, eggs and brown sugar. Add in half of the flour mixture and mix well before adding in the other half. Continue to stir gently until everything is well combined. 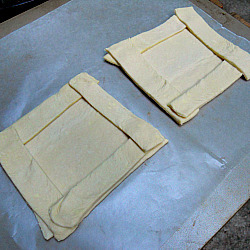 Pour batter into prepared loaf pan and bake for 50-55 minutes, or until toothpick inserted in center comes out clean. Let the bread cool for about 10-15 minutes in the pan before removing it to cool completely on a wire wrack. 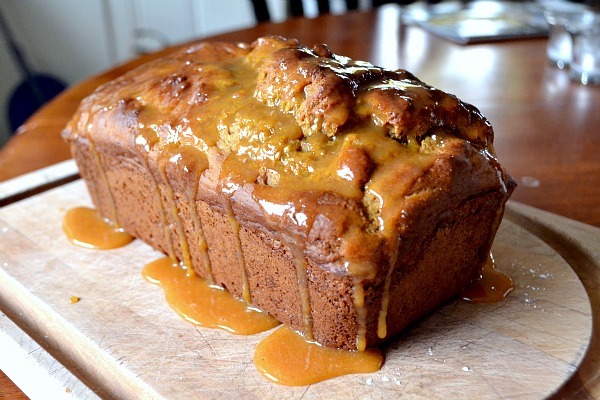 For the glaze, whisk together powdered sugar, milk and pumpkin and spoon over loaf once cool. I have been getting so much inspiration from Southern Living this summer. I’m not sure if maybe they’ve had a change in their food department or have just been focusing more on improving/freshening their food features but the recipes they have been publishing have been wonderful! I have a long list of things that I’d like to try from recent issues. 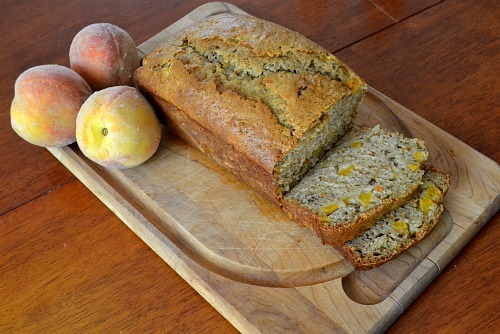 This Spiced Peach Carrot Bread was a “must make ASAP” and given the constant presence of peaches on my counter during the late summer months, I had all the ingredients on hand. 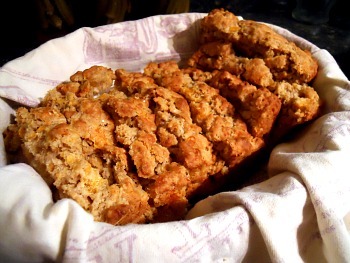 I really enjoy quick breads and loved the idea of peach and carrot bread in lieu of the usual banana base. I made some modifications to the original recipe. I doubled the spices, replaced some of the oil with Greek yogurt and added vanilla extract. The bread turned out beautifully and it’s so easy to prepare. You only need one bowl and no mixer! It was great on its own and it was especially tasty topped with almond butter for breakfast. This will definitely become a yearly summer staple. Enjoy the last of the summer peaches (before we are bombarded with all things pumpkin and winter squash!) and make this recipe. Preheat oven to 350 degrees and prepare a 9 x 5 loaf pan with cooking spray. Toast pecans either in the oven in a shallow pan for 8-10 minutes or on the stove top in a pan over medium heat. Stir occasionally. When they are fragrant and slightly darkened in color, they are ready. Allow to cool. Stir together flour, sugar, cinnamon, nutmeg, baking soda, baking powder, and salt in a large bowl. Add the peaches, carrots, oil, yogurt, milk, eggs, vanilla and pecans and stir until just moistened and combined. Pour batter into prepared baking dish and bake for about 1 hour and 10 minutes or until a toothpick inserted in the center comes out clean. Cool in pan for 5 minutes before removing and placing on a wire rack to completely cool. I discovered this beer bread recipe several years ago on the now defunct blog, Good Things Catered. I’d never made (or heard of) beer bread before and was amazed by how easy and delicious it was. Somehow I forgot about this recipe until recently. 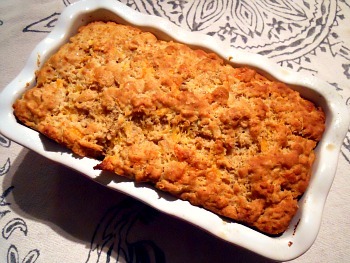 I was looking for an alternative to cornbread to serve with chili when we had friends over for dinner and remembered this beer bread. It was a huge hit with everyone and I have now served it to two different groups of company and received raved reviews from both groups. The best thing about this bread is how easy it is to prepare. It has a short ingredient list, is assembled in one bowl and in the oven in five minutes. Also, the house smells amazing while it is cooking. I have made a couple of modifications to the original recipe and am posting my version below. Note, I cannot link to the original recipe because the blog has been removed. 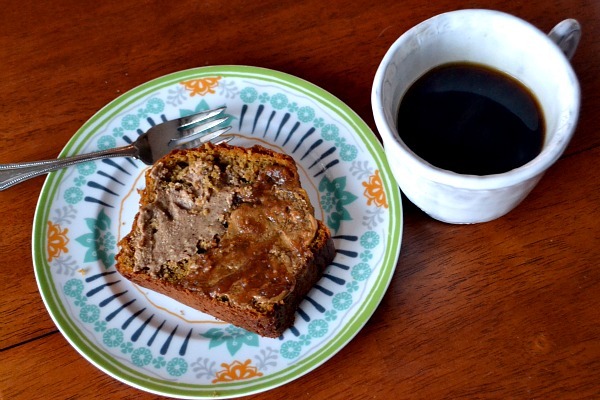 Please make this beer bread this winter and let me know what you think! I’m willing to bet it will become a favorite! A sprinkle of your choice of fresh or dried herbs, we like rosemary, chives, thyme, etc. Preheat oven to 350 degrees. Prepare a loaf pan with cooking spray. In a large bowl, whisk together flours, sugar, baking powder, salt, garlic and herbs. Add cheese and whisk to combine. Slowly add beer to dry ingredients and stir until just combined. Dough should be thick. Knead dough a couple of times until it comes together. Place dough in prepared loaf pan and pour melted butter over. Bake 55-60 minutes or until a wooden toothpick inserted in the center of the bread comes out clean. I was born and raised in Georgia and one of my favorite Southern foods is cornbread. Especially the old fashioned, slightly sweet variety that is baked in a cast iron skillet with plenty of butter and topped with honey. When I saw this recipe on Pink Parsley for Jalapeno Cheddar Cornbread, I decided I would have to stray from my old favorite and give it a try. I’m so glad I did. This is nothing like traditional cornbread but it’s a fun twist on the classic. The addition of sharp cheddar cheese, fresh jalapenos and scallions is delicious and I just have to mention how fabulous this smells when it’s baking. I made this to take to a family dinner and I had to use all of my willpower not to sneak a taste of it on the car ride over. This recipe makes a ton. I served it to eight people and had a good bit leftover but the recipe could be easily halved and it also freezes really well. I think this would be a perfect bread side item for a summer cookout. I also think it would be nice to make these as muffins if you’re feeding a crowd so that it’s easier to grab and go. Just some ideas for you! In a large bowl, sift together flour, cornmeal, sugar, baking powder and salt. In a separate bowl, combine buttermilk, eggs and butter. Make a well in the center of the dry ingredients and pour in wet ingredients. 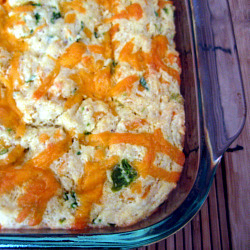 Stir until just combined and then mix in 2 cups of the cheddar, scallions and jalapenos. Stir until just combined, being careful not to overmix. 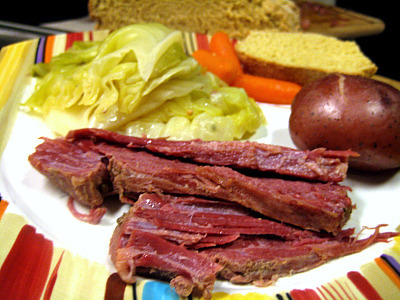 Allow the mixture to sit at room temperature for 20 minutes. Meanwhile, preheat the oven to 350 degrees and grease a 9 x 13 baking dish. 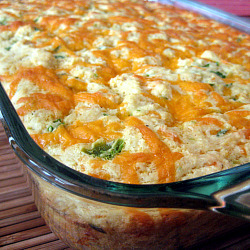 Spread the batter into prepared baking dish and sprinkle with the remaining cheddar. Bake for 30-35 minutes, or until a toothpick inserted in the center comes out clean. 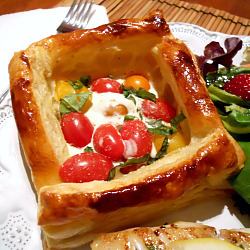 Cool slightly and cut into squares to serve. I have yet to find the perfect pizza dough recipe so it was definitely something I wanted to try during 68 Days of Gourmet. And unfortunately, I will be continuing the search for the perfect pizza dough because this was not it. This dough wasn’t bad just average. It was pretty difficult to work with – sticky and tore easily. There was pretty much no way I was going to get it into a circle when I was shaping the dough so we ended up with very strangely shaped pizza. Luckily, things looked up once I topped it with all the fixings for barbecue chicken pizza and baked it on a hot baking stone. 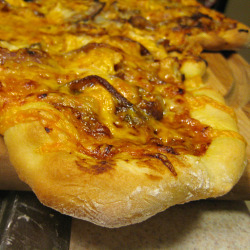 The dough was crispy and chewy (good for thinner-crust pizzas) and the flavor was nice. 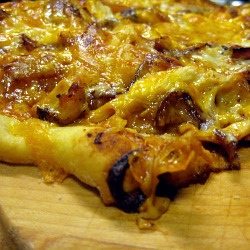 Barbecue chicken pizza is a great flavor variation from your typical pizza. If you’ve never tried it you must! I’m blogging from Atlanta. I’ve spent the weekend here visiting my parents while Brandon has been in New Orleans for a bachelor party. He’s flying back to Atlanta tonight and then we’re making a late night drive to Charlotte. His flight has been delayed and he’s not getting in until 11 so we won’t get back to Charlotte until 3 a.m. at the earliest. Tomorrow is going to be a long day at work! It’s been a nice and relaxing weekend hanging out in Atlanta with my parents. When I arrived late Friday a yummy pizza from Grant Central Pizza in East Atlanta Village was awaiting…along with some strawberry shortcake (one of my favorite desserts!). Saturday morning I visited a yoga class at Yoga Samadhi in Inman Park. Since the weather was so beautiful, there ended up only being one other guy in the class. It was pretty nice having a semi-private lesson and the instructor, Stephanie, was great! Saturday night we had reservations at Nino’s. It’s a family owned Italian place that’s been open since 1968. It was old-school Italian and really delicious. I believe that there is infinite value in keeping things simple and traditional. Working with floured hands, knead dough on a work surface until dough is smooth, soft, and elastic, about 8 minutes. Relflour hands and work surface when necessary. Alternatively, use a stand mixer fitted with the bread hook and knead on low speed for 8 minutes. Divide dough in half and form into 2 balls. Generously dust balls all over with flour and put each in a medium bowl. Cover bowls with plastic wrap and let dough rise until doubled in bulk, about 1 1/4 hours. To bake, preheat pizza stone in a 450 degree oven for 30 minutes. Add whatever toppings you would like and use a pizza peel or well floured baking sheet to slide pizza onto baking stone. Bake for 18-20 minutes, start checking pizza for doneness after about 15 minutes. Or try our favorite Barbecue Chicken Pizza!